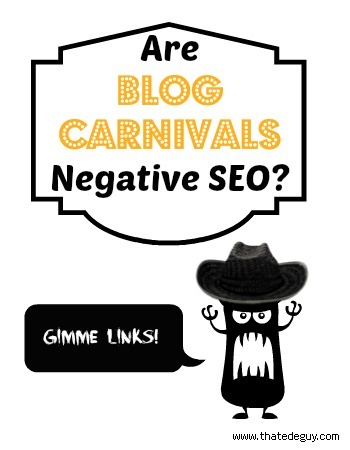 Are Blog Carnivals Negative SEO? I recently read a post from Mike on Jim’s site Microblogger that shows some pretty irrefutable proof that blog carnivals are dead. Or, at least that using them for link building can have the opposite effect that you might like to have on your site. In the article, Mike goes through the work he did, and explains how he then used the Google Disavow tool to disavow some links. Most of those links were from blog carnivals and blog festivals. The results he gets are pretty spectacular, really. He’s got some nice graphs to show it, but I won’t be stealing those, so click on the link above to see them. One of the first things that popped into my head when I read the article on Microblogger was that I had hosted a few blog carnivals on Beating Broke. And what would happen if, instead of first requesting the links be removed, someone that had been included in those carnivals just decided to go straight to the disavow tool and disavow the link? Would it negatively effect my site? What if I followed the advice of the article and asked for links to be removed and then disavowed the rest? Would I be negatively effecting the owners of those sites? In short; would I be hurting my blogging friends by disavowing links from carnivals they had hosted on their sites? As is usual when I have a question about something like that, I go straight to Google and start doing some research. What I found was somewhat reassuring. Eric Ward wrote for Search Engine Watch about asking Google specifically whether disavowing a competitor’s links would hurt the competitor’s search rankings. He details the answer he got, but the general gist of it was that using disavow would not hurt the competitor’s search rankings. Eric goes on to give a little more detail and explanation as to his understanding of the answer. The longer I think about it, the more reasonable it seems that using the disavow tool would not cause the domain of the disavowed link any real harm. After all, think of what that would open up as far as black hat negative SEO options! It’d be no time at all before the disavow tool would be devalued by all the excess noise and wouldn’t present any kind of reasonable signal for the algorithm. While I was reading more on the subject, I also stumbled upon this post from Danny Sullivan where he has a Q&A with Google’s Matt Cutts. Matt is the head of the web spam team at Google. In the Q&A, Danny specifically asks if the disavow tool could be used as a negative SEO tool. The answer he gave is somewhat interesting, and gave me pause. Right now, we’re using this data in the normal straightforward way, e.g. for reconsideration requests. We haven’t decided whether we’ll look at this data more broadly. Even if we did, we have plenty of other ways of determining bad sites, and we have plenty of other ways of assessing that sites are actually good. As usual, Matt is somewhat vague when he’s giving his answers. But, I found it of note that he doesn’t directly slam the door on the disavow files to be used as a part of the algorithm. The second part of the answer is even more interesting. “If a webmaster wants to shoot themselves in the foot and disavow high-quality links, that’s sort of like an IQ test and indicates that we wouldn’t want to give that webmaster’s disavowed links much weight anyway.” He goes on to call Blackhats lazy, which may or may not be true, but that’s besides the point. What he’s really saying is that blackhats are unlikely to put all the effort into building up a good site, with good links, and then disavow those good links. In that regard, he’s right. But, we bloggers aren’t blackhats. We certainly aren’t lazy. We have put a lot of effort into building up our good sites, with good links. Are we failing the “IQ test” by then disavowing some of those good links from carnivals? The answer to that really depends on whether those links from carnivals are considered good links or not. I’m sure there are many indicators that Google looks at to determine what is a good link or not. I also think we can probably look at a few indicators that can give us a pretty good guess as to what Google is going to think of that carnival link. What domain does it originate from? If the domain is loaded up with terribly written posts that are stuffed with keywords, bad English, and not very helpful, chances are Google doesn’t think much of it. On the other hand, if the domain is an informative site that’s well respected in the community, Google probably knows that too. Most blog carnivals are probably hosted on pretty decent domains. What is the link density of the page with the link? How many links are on the page? In the case of a carnival, there probably are no fewer than 50. Some of the more popular carnivals receive hundreds. Before, this might have just devalued the amount of “juice” you got from the link, but it may be penalized further based on the results that the Microblogger post showed. What is the link neighborhood like? If there are 100 links in the carnival, are they all good links? Chances are that they aren’t. Chances are the host of the carnival didn’t take the time to fully vet and edit the links. Most are probably O.K., but there are going to be quite a few more nefarious links in there too. You’ve heard the saying that “one bad apple spoils the whole lot”, and this is a case of one bad link spoiling the whole carnival. There are many other indicators that Google is going to look at, but I think those three factors are the ones that are most relevant to the blog carnival discussion. One other small note here; As time passes, the answers to all three of those indicators could change. Blogs die every day. What might have one time been a very upstanding, informative blog might get recycled by a spammer after the domain fails to get renewed. That’s a good reason to continue to be vigilant about all of your incoming links, but especially ones where all those factors could make the carnival a very bad place to be linked in. With all of that being said, should we disavow links from blog carnivals, or not? From a strictly SEO perspective, I think the answer is a resounding yes. Ask to have as many of them removed as you are able. Those that aren’t removed, add to your disavow list. I still think it’s a bit hazy from a blogger’s standpoint. The disavow lists aren’t being used as indicators of domain quality. Right now. Cutts leaves that wide open for future use in his Q&A with Danny Sullivan (link above). So, are we doing harm by adding quality sites (just not necessarily quality links) to our disavow lists? Honestly, I think only Cutts and Google really know the right answer to this one. Site SEO changes pretty rapidly. At the moment, adding low quality links from high quality sites doesn’t appear to do any harm to the high quality site, so I think it’s probably fine to disavow links from those high quality sites that we think are low quality links (like carnival links). Is Hosting a Carnival Just as Bad? If links from carnivals pointing at your site is bad, what about being the site that hosts the carnivals? Probably just as bad. For all the reasons that having that link pointing to your site is bad, hosting those links is probably just as bad. In fact, it may be even worse. After all, having those links pointing to your site is fixable by having the links removed, or adding them to your disavow list. If the links in a carnival that you hosted are disavowed, it (probably) doesn’t do anything negative to your site. But, you can’t disavow your own pages… The posts and pages you host on your site are directly tied to your site (obviously) and if there’s reason to disavow a link on one of your posts, chances are that it is being taken into account by Google for your search rankings. Hosting bad content with bad links is always bad. If you own/run a blog, you really should be using something to check your site for broken or redirected links. Spammers like to pick up used domains that used to have a lot of quality links because there are sites out there that don’t check for broken or redirected links, and those links can then be redirected or repurposed for their spammy purposes. I use a plugin for WordPress called Broken Link Checker. It automatically goes through and checks for broken and redirected links and then gives me the ability to work through the queue and delete or fix those links. With the devalued nature of Carnivals, it’s probably a good idea to just go ahead and delete any that you hosted. Especially if they’re older, or if you didn’t take the time to edit and vet the links that were submitted to the carnival. It’ll probably also cut down on the number of emails you get from carnival participants asking for their links to be removed. Have you participated in blog carnivals in the past? What steps are you going to be taking (or not)? An important part of any SEO strategy is backlinks to your site. There’s two main reasons why they are so important. First, they help sites get indexed faster by the search engines. And the faster they get indexed, the faster that they get crawled and ranked. Secondly, it’s widely accepted that the number and quality of backlinks is taken into effect in the search engine rankings for keywords. More backlinks is better. No doubt. Backlinks, while one of the important factors of SEO is also one of the most reviled by those doing the building. It can be a time-consuming and boring process. There are services that will do it for you, but he process becomes expensive, quickly. But, you can do it yourself, easily, with SocialMonkee! SocialMonkee is an instant backlink builder that allows you to add 25 unique backlinks to your site, every day, for FREE! Each link is unique, and exists on a unique C-Class IP address and domain. Stop dreading backlink building, and start creating 25 unique backlinks every day, with the click of a mouse, for FREE! 25 unique backlinks every day! Do the math. That’s 175 backlinks a week. 750 each month. Want more? There’s an upgrade option that allows you to build 100 unique backlinks, not just once a day, but 3 times a day. That’s 2100 backlinks a week and 9000 a month! Upgrading is easy. All you have to do is refer 12 new members, and you’re automatically upgraded. Don’t think you can refer 12 new members? You can pay a one time fee (currently $47) and upgrade instantly. Creating your backlinks is super easy, too! Just log in, enter a few bits of info, and your done. All in under two minutes. If you want to make it quicker, you can download the plugin for Firefox and submit your page with just a few clicks. If you’ve got the upgraded account, you also get access to link reports and RSS feeds, which help you keep track of the backlinks you’re getting. So what are you waiting for? Join SocialMonkee now while it’s still free! Y0u need to be in the local market right now. This very instant. The internet is a big, wide open, space. You’re wasting your time trying to compete against all the global marketers out there. Especially when there’s this huge gold mine sitting in your own backyard. Do me a favor. Go and do a Google search for your hometown with the term “dentist” following it. Chances are, you’re looking at a list of dentists in your town. Depending on the size of your hometown, you could be looking at a search term that gets thousands of searches every month. What value could you lend to any one of those dentists by increasing their ranking for that term? How much could that be worth to them? There are several ways to capitalize on that. You could do some sort of affiliate program. Set up a way to track the contacts and then the dentist pays you based on the total number of leads. Or, pays you on number of people who set up an appointment. Or, do it as a consultant. Get a nice little retainer fee as well as ongoing monthly charges for work done. There are plenty of ways that you could make it work for you. Heck, why limit yourself to just one dentist? Set up your own website as a list of local dentists. Get it to rank #1, and then start charging dentists to appear on the website. Collect the visitors names and then route the contacts through to a dentist who’s paying you per lead. If you live in a small enough area, you could likely take that number 1 spot pretty easily. The point is, just because the internet is global, doesn’t mean you have to think globally. There are plenty of local companies that don’t do global business (like dentists) who are just as in need of your services. Not only that, but you’ll have far less competition locally. Get into the local market and start making some money! Everybody has ’em. Little relationship nuggets that they swear by that lead to happiness and utopia. (Nevermind that they are invariably flawed.) And just like dating, SEO and marketing have some rules that are better lived by. The Grass is Always Greener: Remember that hot twitter star (@lisabarone) that you had your eye on? How your infatuation got in the way of your relationship? Then, when the relationship was over, that star wasn’t so bright? Sometimes it’s better to be focused on what you’ve got rather than the hot new thing. It Still Pays to be Nice: Unless you really are the leather wearing, Harley riding, Marlboro Red smoking, bad boy of marketing, it still pays to be the nice guy on the block. Nobody likes an a$$hat. No doubt, there is money in blackhat, but white/gray hat is still the right thing and will get you further. Besides, do you want to be looking over your shoulder all the time for the father with the shotgun? Chocolate Helps: Just because you’re the nice guy doesn’t mean that a little bribery isn’t in order now and again. Cut Your Losses: Sometimes the relationship is just doomed. Sometimes, no matter what you do, the two of you are just not meant to be together. And, while it probably is a bit taboo in dating, selling your site is an option. Pay Attention: Sitting at your PC and gaming all the time is a surefire way to get dumped. It’s also a good way to not get anywhere, and not sell anything. Treat your business like a good date and you’ll have success most of the time. Remember though; Sometimes it just isn’t a match. Until you decide that, put your full effort into the relationship and make it bloom!